You may be worried about your house reeking of vinegar. Not to worry! The smell disappears once it dries. Here are some uses of white vinegar for your home, broken down by area. Floor (linoleum and wood)-Add 1/2 cup of vinegar to a warm bucket of water. Remember, the vinegar smell will go away after it dries, but you can add about 15 drops of your favorite essential oil to your bucket for fragrance. My suggestions are: lavender, lemon, pine and eucalyptus. Garbage disposal- you can make full-strength white vinegar ice cubes by pouring white vinegar into an ice cube tray. Pour several cubes down the disposal while flushing with cold water. This will not only clean and deodorize the disposal, but also kill mold and bacteria. Microwave- in a microwave dish, add 2 cups of water and 1/4 cup of vinegar and heat it for 3-4 minutes. Once you're done, stuck on grease and food should come off easily. Coffee maker- this can be done once a month to improve the taste of your coffee and remove residue. Add white distilled vinegar to the 6-cup level and water to the 10-cup level. Put in an empty paper filter. Pour the vinegar and water solution into the coffee maker and allow it to sit for a few minutes before turning it on and allowing the vinegar to run through. After you're done, be sure to run clean water through the coffee maker to remove vinegar taste. Use warm water and vinegar to remove coffee stains from your coffee pot. Dishwasher- you may clean and deodorize your dishwasher by adding 1 cup of white vinegar to the empty dishwasher and run the short cycle. You may also add vinegar to your rinse dispenser instead of using Jet Dry! Clean the wheel of a can opener by using white vinegar and an old toothbrush. Disinfect dishrags and sponges by soaking them overnight in a bowl filled with just enough water to cover them and adding 1/4 cup white vinegar. Keep fruit flies away by setting out a small bowl of undiluted white vinegar. Get rid of bad food smells from a refrigerator by rinsing the area with soap and water. Fill a spray bottle with undiluted white vinegar and spray the surfaces, then wipe them down with a damp cloth. For smelly and/or stained Tupperware or other plastic containers, dampen a cloth with white vinegar and wipe them down. Cooking odors can be eliminated by boiling 1 tablespoon of white vinegar for each cup of water. Odors from smoke can be eliminated by placing a small bowl of white vinegar in the room. For stubborn stains, you may use full-strength white vinegar. Soak shower heads in a hot vinegar solution (you'll be amazed at how it removes hard-water stains)! To make chrome sink fixtures shine (dulled from lime buildup) use a paste of 2 tablespoons salt and 1 teaspoon white distilled vinegar. Really like scouring cleaners? Make your own by combining 1/4 cup baking soda with 1 tablespoon of your favorite eco-friendly liquid detergent. Add a few capfuls of white vinegar to give it a creamy think texture. For gunky/stinky drains, clean and deodorize by pouring 1 cup of baking soda and 1 cup of hot white distilled vinegar. Let it sit for 5-10 minutes, then run hot water down the drain. 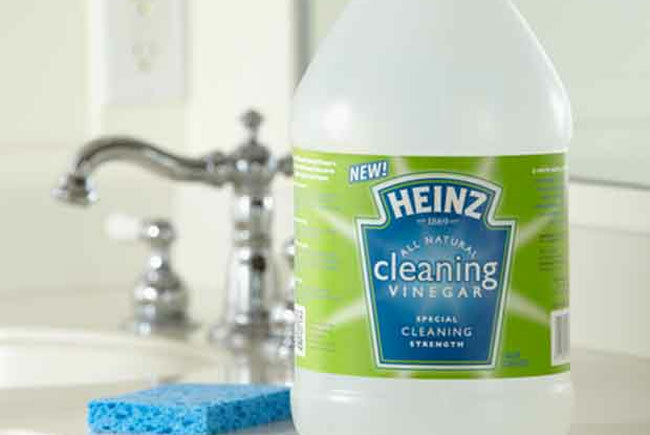 Deodorize the toilet bowl by letting 3 cups of white distilled vinegar sit in it for 20-30 minutes before flushing. Make your toilet bowl sparkle by pouring 1-2 cups of diluted white distilled vinegar and let it sit for several hours or overnight. Swish with the toiled brush and flush. For general cleaning of high-traffic/problem areas on carpets or rugs, use a solution of equal parts white vinegar and water. Use a sponge to lightly press the solution into carpet, rinse then blot dry with a towel/rag. Let the carpet dry before using the area. Ketchup: To remove, use a mixture of 1 cup vinegar and 2 cups water and sponge into the rug. Wring out the sponge frequently until the stain is gone. Chewing gum: Moms will love this one! To get rid of chewing gum stuck in carpet (or any cloth) saturate the area with white vinegar and let it sit for about 4-5 minutes (you can heat the vinegar for faster results). Then carefully pull the gum off. Crayon: To get rid of crayon stains on carpet or any other fabric/surface, scrub using an old toothbrush dipped in white vinegar. Ink: Immediately treat ink stains by blotting and spraying the stained area with hairspray. Once the ink spot is gone, use a solution of 1 part white vinegar and 1 part water on the area to remove the sticky hairspray. Red Wine: Immediately blot all moisture up from the spill, then sprinkle the area with salt. Let it sit for about 15 minutes. The salt will absorb the wine in the carpet (turning the stain pink). Next, clean the entire area with a combination of 1/3 cup vinegar and 2/3 cup water. Coffee: If you clean the coffee-stained area immediately with plain water, it should come out. If you can't get to it right away, mix 1 part white vinegar to 2 parts water and sponge into the rug. Blot up the excess and rinse until the brown stain is gone. Chocolate: Chocolate stains can be cleaned with 1 part white vinegar and 2 parts water. Sponge the mixture, and blot the stain with lots of clean cloths (or towels) until it's gone. Mildew: When mildew gets in a rug, it flourishes and grows. Kill it with a half white distilled vinegar, half water solutions. Make sure the rug dries completely. You can use a hairdryer on the low setting to speed up drying time. You can make hard-surfaced floors sparkle by using white distilled vinegar. Wood- Add a cup of white vinegar to a gallon bucket of water and mop hardwood floors lightly (don't saturate). You don't have to rinse. Now your floors will be shiny and greasy buildup will be removed. Ceramic tile- Add 1 cup of white vinegar to 1 gallon water and mop to make these floors sparkle. Vinyl/Linoleum- You may scrub these floors with a mixture of 1cup white vinegar and 1 gallon of water. For extra shine, use club soda. For extra tough stains on linoleum floors, apply full-strength white distilled vinegar and leave it on for 10-15 minutes before wiping it up. For additional cleaning power, add a sprinkle of baking soda over the white vinegar. Kill germs by spraying full-strength white distilled vinegar on doorknobs and other frequently used surfaces, then wipe dry. Remove film from baby bottles by filling them with equal parts hot water and white distilled vinegar. Let sit for at least an hour, then scrub with a bottle brush. Clean and disinfect vinyl baby books and board books by wiping with distilled white vinegar. Wipe clean with a damp cloth. Clean and disinfect baby toys by adding 1/4-1/2 cup of white distilled vinegar to soapy water. Clean and deodorize urine on a mattress with a water and white distilled vinegar solution, then sprinkle with baking soda and let dry. After it's dry to the touch, brush or vacuum. For sticky scissors, wipe with a cloth dipped in undiluted white vinegar. Clean your grill by scrubbing it with wadded up aluminum foil with white distilled vinegar spritzed over it. For hardened paint brushes, clean by first soaking then in a pot filled with white distilled vinegar for about an hour. Then heat the pot with the brushes and vinegar to a simmer. Drain and rinse clean. Get decals off walls or doors by soaking in undiluted white vinegar for several minutes before peeling them off. Repeat as necessary. Removing wallpaper is a breeze when you use a paint roller to wet the surface thoroughly with a solutions of equal parts hot water and white distilled vinegar. You can also use a spray bottle to saturate thoroughly. Make your own window cleaner by mixing a solution of 1/2 cup ammonia (non-sudsy kind), 1 cup white distilled vinegar, and 2 tablespoons of cornstarch in a gallon of water. Remove those pesky pain splatters from windows by applying full-strength white distilled vinegar with a clean paintbrush. Wipe out dust, mildew and odors by wiping down walls with undiluted white distilled vinegar on a cloth or sponge. Clean walls and woodwork using a combination of 1 cup white distilled vinegar, 1/2 cup ammonia, 1 cup baking soda added to 1 gallon of warm water. Use a damp (not wet) towel or sponge to wipe down. Clean up pet accidents by blotting area first, then add a white distilled vinegar and water solution. Blot until nearly dry, then sprinkle baking soda over the area and let it dry completely. Vacuum up the area the next day to remove the residue.